The Nokia brand made a comeback in smartphones last year as HMD Global acquired the rights. The company released the Nokia 6, Nokia 5, and the Nokia 3 as its first ever Android smartphones. The phones were followed by the flagship Nokia 8 and the low-end Nokia 2. 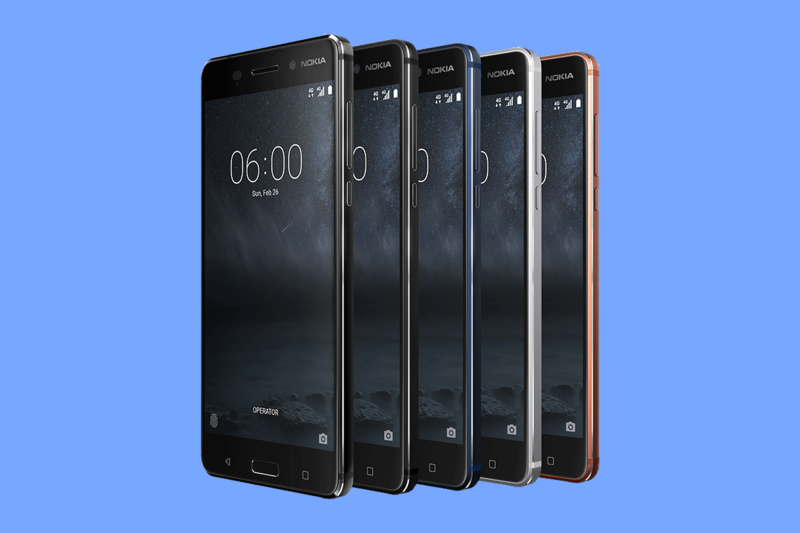 At Mobile World Congress this year, HMD Global released its new device portfolio which includes the Nokia 6 (2018), the Nokia 7 Plus, the flagship Nokia 8 Sirocco, and its first Android Go phone in the form of the entry-level Nokia 1. HMD Global has had a good track record when it comes to rolling out software updates. All of the company’s phones have shipped with stock Android and it has committed to using the Android One platform. The Nokia 8 received Android 8.0 Oreo last year, and later went on to receive the Android 8.1 update. The Nokia 6 and the Nokia 5 have received stable Android 8.0 Oreo updates, and an official beta program is underway for the Nokia 3’s Android Oreo update. Now, the company has started rolling-out the stable Android 8.1 Oreo update for the Nokia 5 and the Nokia 6. The Android 8.1 Oreo update for the Nokia 5 is available in India, Indonesia (TA-1053), and Tunisia (TA-1053). 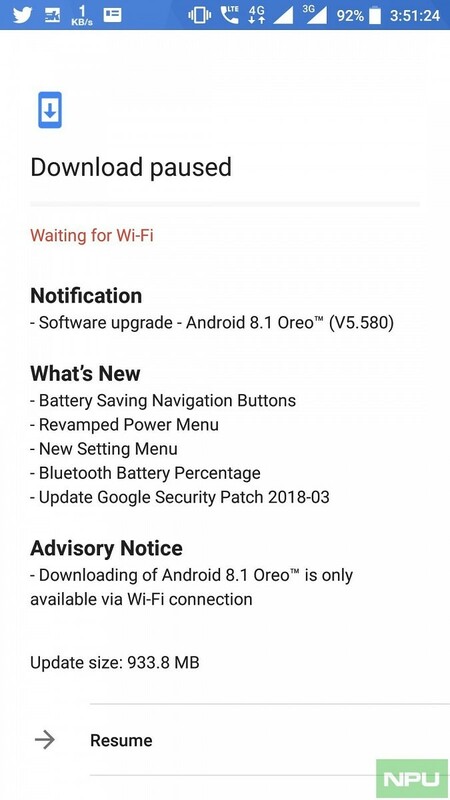 On the flip side, the Nokia 6’s Android 8.1 update is currently available in India. The update brings the March security patches and a new settings menu, according to the changelog. It also contains “battery saving navigation buttons,” a revamped power menu, and Bluetooth battery percentage. The Nokia 5 and the Nokia 6 were both launched at MWC 2017. The Nokia 6 has the Qualcomm Snapdragon 430 system-on-chip, 3GB/4GB of RAM with 32GB/64GB of storage, 5.5-inch Full HD (1920×1080) IPS display, 16MP rear camera, 8MP front camera, and a 3000mAh battery. The Nokia 5’s list of specifications includes the Snapdragon 430 system-on-chip, 2GB/3GB of RAM with 16GB of storage, 5.2-inch HD (1280×720) IPS display, 13MP rear camera, 8MP front camera, and a 3000mAh battery. Both phones shipped with Android 7.1 Nougat. 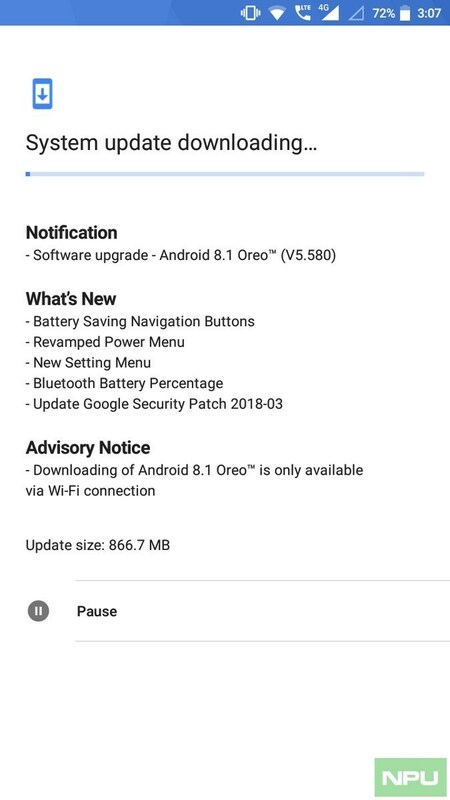 It’s good to see the Nokia 5 and the Nokia 6 receive stable Android 8.1 Oreo updates. Android 8.1 is a small update over Android 8.0, but the speed of the update roll-out means that the phones now belong to the few budget and mid-range devices that run Android 8.1, instead of an older Android version. We applaud HMD Global for its fast roll-out of software updates and hope the good run of form continues.